Ask practically anyone what advice they would give their younger selves and most often “wearing more sunscreen” will inevitably come up as a solid answer. No one talked about the importance of sun protection in my youth as a daily practice. Sun care was usually just reserved for vacationing or beach trips. We now know differently. Sun protection is not a luxury item, nor is it meant for a life of leisure. Sunscreen is meant to be used daily and we need to begin making it a priority. After having a skin cancer scare a couple of years back, I’m religious about getting my moles checked yearly and wear SPF on my face daily—even in the winter months. And let’s not forget the importance of wearing sunscreen on our hands, neck, and cleavage when driving. Imagine the long-range effects of the direct sun that hits you when you’re stuck in traffic! With warmer weather ahead (goodbye coats), The DERMAFLASH Team is hoping you’ll wear more sunscreen—even when just running errands. And moms, get your kids to use sunscreen at an early age. It needs to become a habit so the next generation doesn’t make the same mistake we did. Sun protection should never be an afterthought or reserved only for vacations. Use sunscreen and sunblock to protect against skin cancer. Skin cancer rates are on the rise, and we all owe it to ourselves and those we love to apply appropriate and adequate amounts of sun protection. Shielding ourselves from the sun’s harmful rays is even more necessary these days with considering ozone layer depletion. Years of not wearing sun protection can lead to skin discolorations, uneven pigmentation, and (preventable) brown sun spots on the face. Those sudden spots aren’t freckles, it is your skins way of responding to years of unprotected sun exposure. 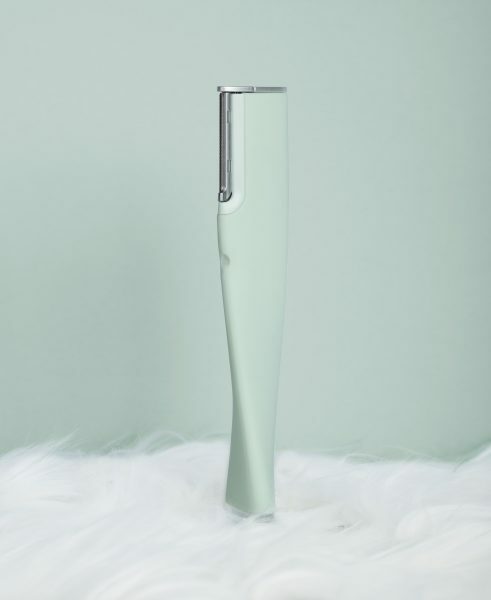 Luckily, dermaplanning with your DERMAFLASH LUXE can help diminish those spots, but let’s try and avoid them whenever possible. I think we all recognize the healthiness of aging gracefully, but don’t invite premature wrinkles and fine lines because we forgot to apply sunblock and sunscreen. With the advancement of modern cosmetics, we can luckily apply sun protection that acts as makeup coverup as well. 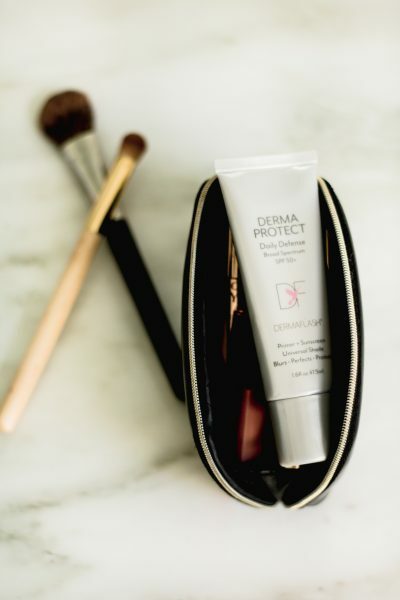 Our DERMAPROTECT, a tinted moisturizer with SPF 50+, is a good example of a light tinted coverup with Broad Spectrum UVA/UVB protection. 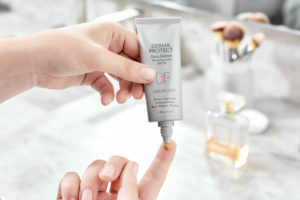 Ideal as a primer under makeup or when you want to keep things fast and natural-looking, our universally flattering tint will provide a veil of both color and protection from free radical damage and premature aging. Sun damage is the result of your skin’s inability to repair itself, often resulting in sunburns. Sunburns may last only a few painful days, but their harmful effects last a lifetime. Furthermore, UV radiation can actually damage your DNA and cause cell damage. So even if your skin tans easily, harm can still occur. This impressive video demonstrates what skin looks like under ultraviolet light and how sunscreen helps to shield against the sun. We’re sure you’ll never leave the house without sun protection again. All of us at DERMAFLASH invite you to take action by learning how to check for moles and remaining diligent about protecting your skin. Let’s be better about developing consistent sunscreen habits starting today. We owe it to our skin—it’s our biggest organ!